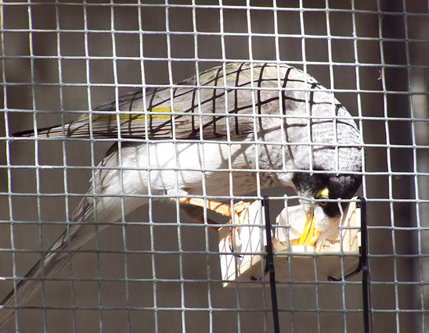 The noisy miner feeds on nectar and invertebrates. These two resources have very different distributions in the natural world. Nectar is found in flowers, which are immobile, visually conspicuous locations. Nectar also tends to deplete after a single visit and then replenish after a reliable period of time. Invertebrate prey, however, are mobile and typically inconspicuous, so they're precise locations are transient and more difficult to predict. They also tend to aggregate. This behaviour, combined with their mobility, means that a patch of invertebrates doesn't reliably deplete after a single visit, unlike the nectar in a flower . All of these differences in resource distribution mean that the optimal search strategies for these two resources are likely to differ. 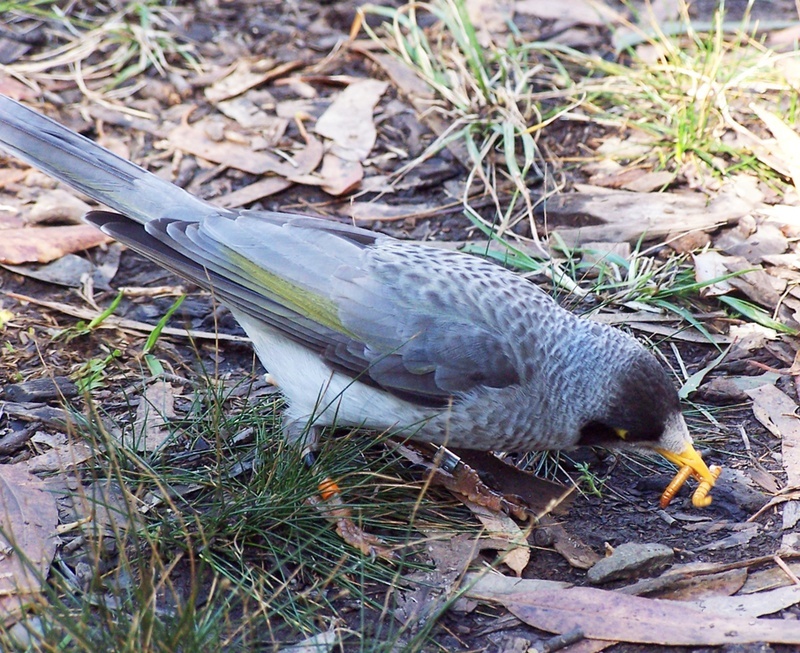 My research using the noisy miner suggests that different cognitive strategies are used by the birds when searching for either a nectar or an invertebrate reward and the strategy that is used is triggered proximally by the ingestion of the reward itself. The picture to the right shows 'Little', one of the first birds I ever trapped to participate in these studies. 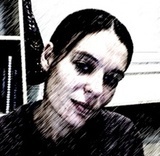 This is him some twelve months after being released. He was re-trapped and re-used several times for various pilot studies and became a veteran of the lab. He continued to visit the outdoor cages for several years after release, right up until I stopped working at the site. The tendency to avoid sites where food has previously been found in favour of other locations not recently rewarded is termed 'win-shift' behaviour. A tendency to forage in this way has been demonstrated for a variety of vertebrate and invertebrate nectarivorous foragers. Such a tendency increases foraging efficiency since it guides the forager to avoid flowers that have been recently emptied. My first study with noisy miners demonstrated that these birds, when trapped from the wild and placed in a laboratory situation, exhibit a spontaneous tendency to win-shift at short delays, but only if they are rewarded with nectar. If the birds are rewarded with invertebrate prey, they do not show this spontaneous win-shift behaviour and are poor at learning either a win-shift or win-stay contingency (but better at win-stay, if anything). These data presented the best evidence to date that win-shift behaviour is associated specifically with nectarivorous foraging.